Before our family left for our year of travel last month, we wanted to catch up with friends to say goodbye so I planned some kindness inspired get-togethers using the lovely resources from our friends at BucketFillers101.com. One was a “party in the park” and the other was a book reading at my son’s preschool. At both events we read one of the Bucket Filler books to talk to the kids about kindness and then handed out some treats for the kids to take home part of the lesson we shared together. There really doesn’t have to be any special reason to hold a “kindness party” – moving in, moving out, birthday, holiday, starting school, ending school or school holidays are all good reasons! The “party” can be as elaborate or as simple as you wish. The ideas below are just suggestions but there are endless ways to celebrate and learn about kindness. 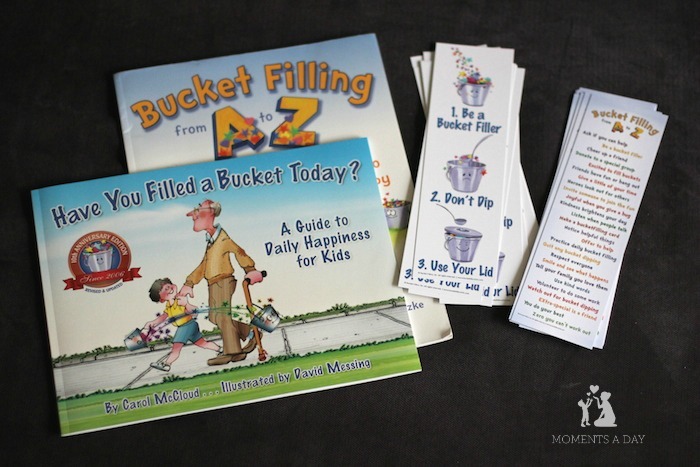 If you are not familiar with the Bucket Filler materials, they are awesome and I highly recommend them! The idea behind “bucket filling” is that every person in the world has an invisible bucket that they fill each day by showing kindness to someone else. The analogy is very tangible for kids – an easy way for them to understand and be inspired to show more kindness to those around them. The kids also enjoyed the colouring page, crossword and word search available on BucketFiller101’s Free Resources page. I just printed out the downloadable pages and set them out on a table with a couple dozen coloured pencils… super easy activity which kids can enjoy separate or in teams! For my younger son’s class (four year olds), I read one of the shorter books called “Fill A Bucket” which was a good length for that age group. Adding a song or two from the Circle of Light CD is sure to go well with toddlers and preschoolers as well. A couple of these are perfect for marching! Or there’s always musical chairs (run to a chair when the music stops) or musical statues (freeze when the music stops). 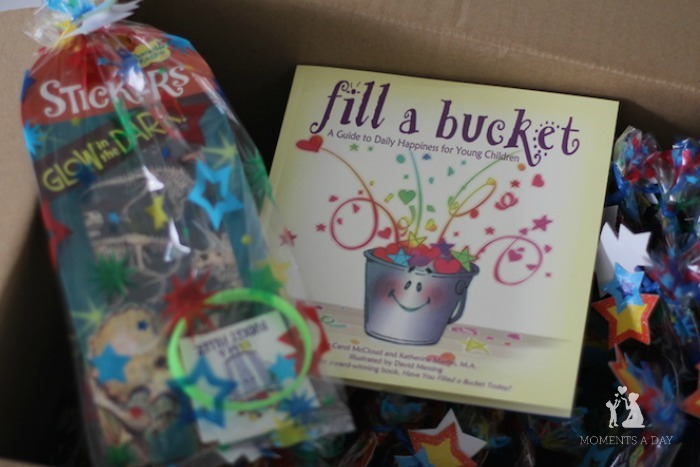 There are quite a few Bucket themed gifts and incentives on the Bucket Fillers website which you can browse here. 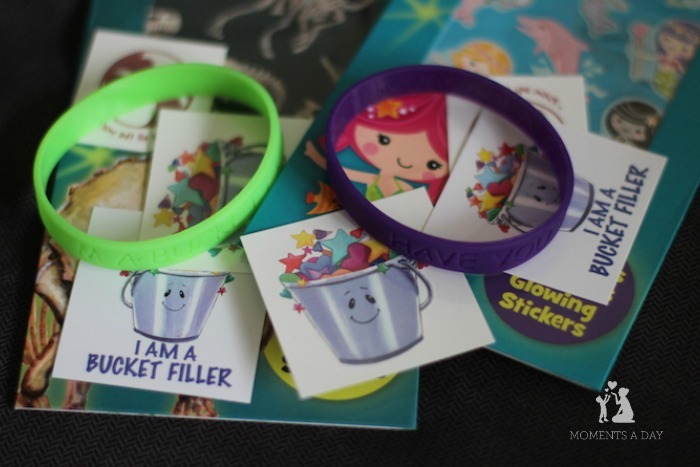 We put together little goodie bags for each child with a bracelet, tattoos, and stickers. This was a nice way for my boys to practice kindness (putting the bags together and handing them out), and hopefully the small gift gave the parents an extra opportunity to discuss the concept of “bucket filling” more with their children at home. Many teachers like to use these items in the classroom as well. We had a few extra goodie bags leftover which I encouraged the kids to take and give away to their friends. 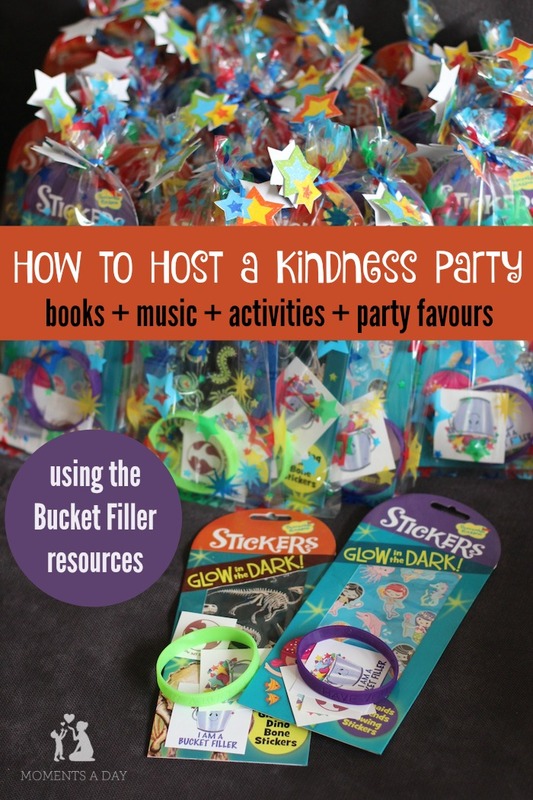 This gave me the idea that next time we host a “kindness party” I would love to incorporate an element of service… perhaps making a card for a child who is unwell or decorating cookies for the neighbours? Both events were laid back and easy, but I felt the kids (and adults) got something meaningful from our time together. It’s always nice to mix character building with fun! Have you ever hosted a kindness party? What else might you include? 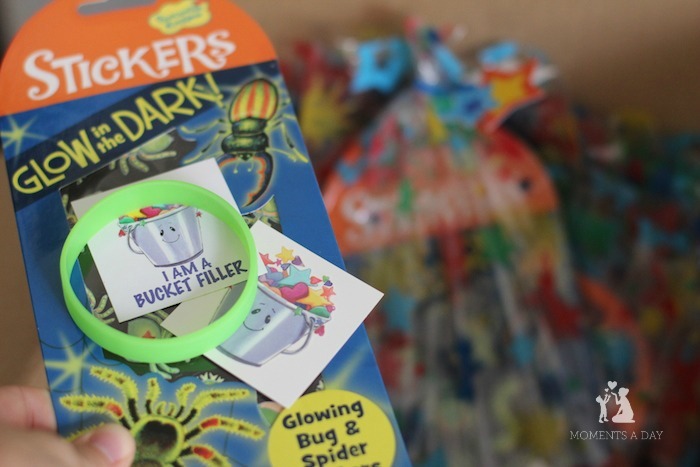 I received materials from Bucket Fillers, Inc to review for this article. All opinions expressed are my own. To find out more about advertisement and reviews on my website please click here. I think kindness parties/activities are a great idea. Great inspiration! I am a grandma and teach Primary Age children at church. I/we often run out of ideas for the children and grandchildren. Also help support young mothers. I am greatly interested in your E-course Lemonade Life Lessons. Families are so special and important. Modern day attitudes, values and standards are slipping. Careers more often overtake growing a family. We need to defend families. Yes they can be hard work and sacrifice. They can also be a joy. Motherhood is a noble and honourable calling. It can be so. Love, understanding and attitude are importyant. Thanks for your input and insight, it is greatly appreciated! I totally agree that we need to defend families. There are so many distractions these days that raising children is sometimes viewed as a “chore” instead of what is really important in the long run. Influencing the next generation is the best and hardest job! LOVE this idea. Sharing on facebook.com/GreatParentingShow/ 25 April.